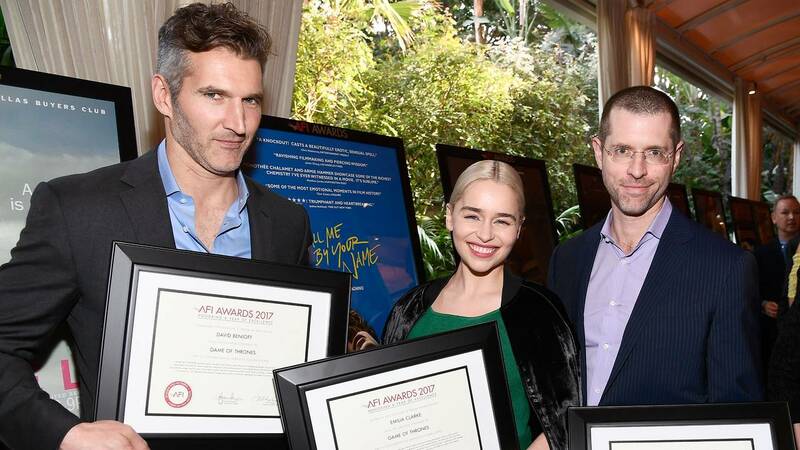 Honorees David Benioff, Emilia Clarke and D. B. Weiss pose with awards during 18th Annual AFI Awards at Four Seasons Hotel Los Angeles at Beverly Hills on January 5, 2018 in Los Angeles, California. NEW YORK (CNNMoney) - "Game of Thrones" creators David Benioff and D.B. Weiss are pivoting from dragonglass to lightsabers. Benioff and Weiss are going to write and produce a new series of "Star Wars" films, Disney and Lucasfilm announced Tuesday. The films will be separate from the current Skywalker saga and another "Star Wars" trilogy in development that's helmed by "Last Jedi" director, Rian Johnson. "David and Dan are some of the best storytellers working today," Kathleen Kennedy, president of Lucasfilm, said in a statement. "Their command of complex characters, depth of story and richness of mythology will break new ground and boldly push Star Wars in ways I find incredibly exciting." Benioff and Weiss are responsible for creating one of the most popular series in the history of HBO, if not all of television with "Game of Thrones." The series, which is based on the books by George R.R. Martin, has built a global fan base and won multiple Emmys. The series, which stars Emilia Clarke and Kit Harington, airs its final season next year. Once the two show runners leave the world of Westeros, they will be taking on one of the biggest blockbuster brands in film history. "In the summer of 1977 we traveled to a galaxy far, far away, and we've been dreaming of it ever since," Benioff and Weiss said in a joint statement. "We are honored by the opportunity, a little terrified by the responsibility, and so excited to get started as soon as the final season of 'Game of Thrones' is complete." Lucasfilm and Disney did not give release dates for the new films but joked that there "have (thankfully) been no sightings of White Walkers around Lucasfilm." The latest film in the "Star Wars" saga, "The Last Jedi" has made more than $1.3 billion at the global box office since opening in December. The next film in the franchise, "Solo: A Star Wars Story," which tells the origin story of the young Han Solo, opens in May.